I have been wanting to install a tankless water heater at my house for many years. After a year of research into how to do this installation, I learned that there isn’t a single place to go to learn how to install a tankless water heater with a recirculating pump. I decided to provide this how-to based on my own experience of installing a tankless water heater with a recirculating pump. Our house came with an older 50 gallon water heater that was on it’s last leg. The heater sprung a leak and my only choice was to replace it. 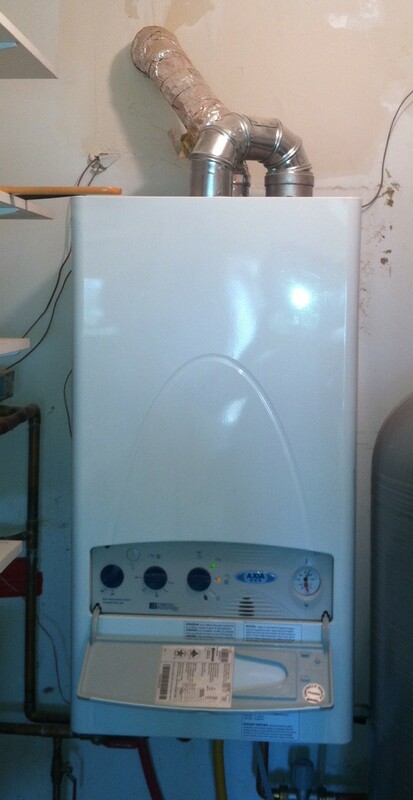 I could replace the heater with a standard tank water heater or take the leap on replacing the heater with a tankless. Disclaimer: By reading this document you shall indemnify, hold harmless, and defend DavidBonal.com, LLC from and against any and all claims, demands, lawsuits, liabilities, losses, damages, costs and expenses, including attorneys’ fees, that arise or result from the use of this article. Now that the disclaimer is out of the way let’s get on to the how-to. Our house already included a recirculating pump which was connected to the tank water heater. I had to preserve this capability since the water heater is in the garage and it is a long way to the furthest hot water faucet and running water for long periods of time to get hot water is criminal in the desert. In this article, I will describe how to design a tankless hot water installation, what to buy, prepare for installation, install the heater, and expectations with a tankless hot water heater. There are several things that you have to consider with a tankless water heater installation: water hardness, gas flow, exhaust and venting, drains, and the dreaded recirculating pump. Hard water will kill a tankless water heater. Calcium build-up will destroy the efficiency of the heater and eventually plug the heater. Be sure to test your water for hardness before installing a water tankless water heater. I live in the southwest, and our water is super hard. I needed to install a water softener as part of the installation. I chose to get the Premier 40,000-grain High Capacity Water Softening System from Costco. The price was great, and it appears to have a high quality Watts valve. The water softener has run flawless since November 2013 and our clothes, and bathrooms have never been cleaner. Life before our water softener was full of calcium buildup on everything, and this water softener has been a complete workhorse. 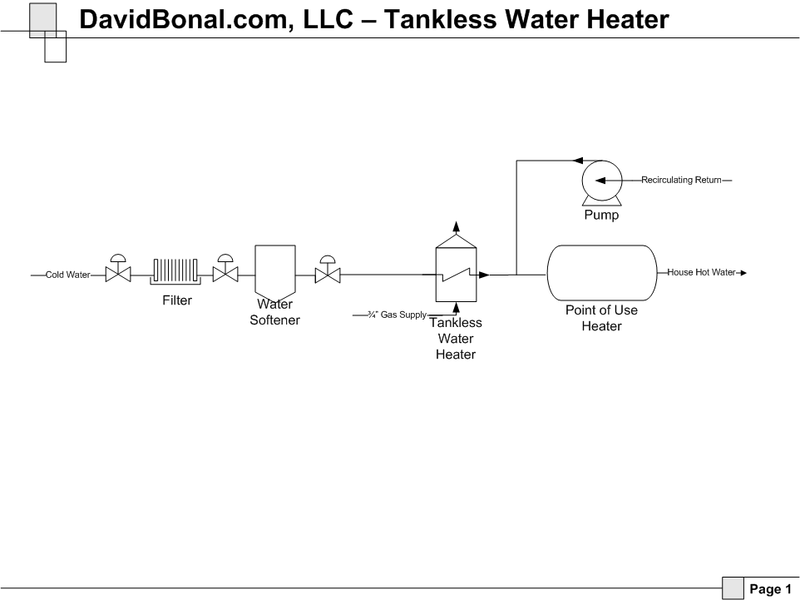 A tankless water heater needs a lot of gas to the heater when it is running. If the heater can’t get the necessary flow of gas, the onboard computer will generate a fault and the heater will not function correctly. If you don’t have a 3/4″ gas line running to the water heater, you are going to need to install that. You need as short of a gas pipe run from the gas meter as you can get with the gas pipe being 3/4″. This is an area that I would encourage you to hire a plumber for. I was blessed that our house had a 3/4″ gas pipe headed directly to the area where the existing water heater was installed. I didn’t need to do any piping from the gas meter to the water heater. Some people suggest that you need to test that you have enough pressure from the gas meter and to install a larger meter from your gas company. I didn’t do any special testing and the gas meter is the original gas meter that was installed with the house in 1991. Venting a tankless water heater is just as important as making sure it gets enough gas. One of the vents on the water heater installation above is used for the fresh-air intake. 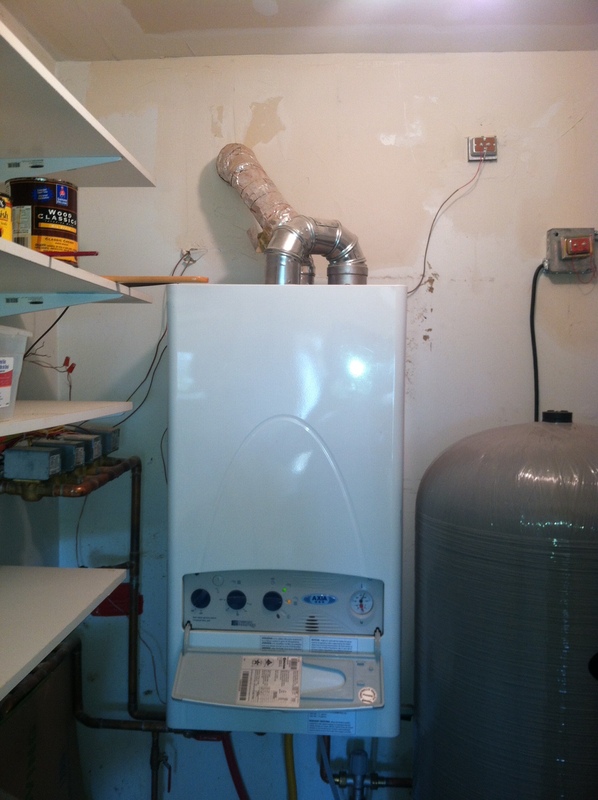 There are so many problems with this water heater installation it is amazing that it even worked in the first place. You need to follow the manufacturer directions on the correct venting to use for your tankless water heater. Read the manual carefully for the tankless water heater that you decide to purchase to make sure that you choose the correct venting. Expect to pay several hundred dollars in vent pipe for your tankless water heater. Expect to pay several hundred dollars in vent pipe for your tankless water heater. It seems crazy to spend that much money on what appears to be plastic pipe, but you just have to do this. It seems crazy to spend that much money on what appears to be plastic pipe, but you just have to do this. I was really nervous that if I hired a plumber to do this install, that they wouldn’t use the correct vent pipe. I was 100% certain that the pipe I purchased was exactly what was specified by the manufacturer. For example, Lowes, carries Jacuzzi Gas Tankless water heaters for the ‘do-it yourself’ crowd. These heaters appear to be Rinnai heaters that have been re-branded as Jacuzzi. If you look carefully, you will notice that Lowes sells a 21″ horizontal vent kit to support their tankless water heaters. This vent kit is concentric venting from Ubbink Rolux. This vent kit from Lowes will only support horizontal vent installs. 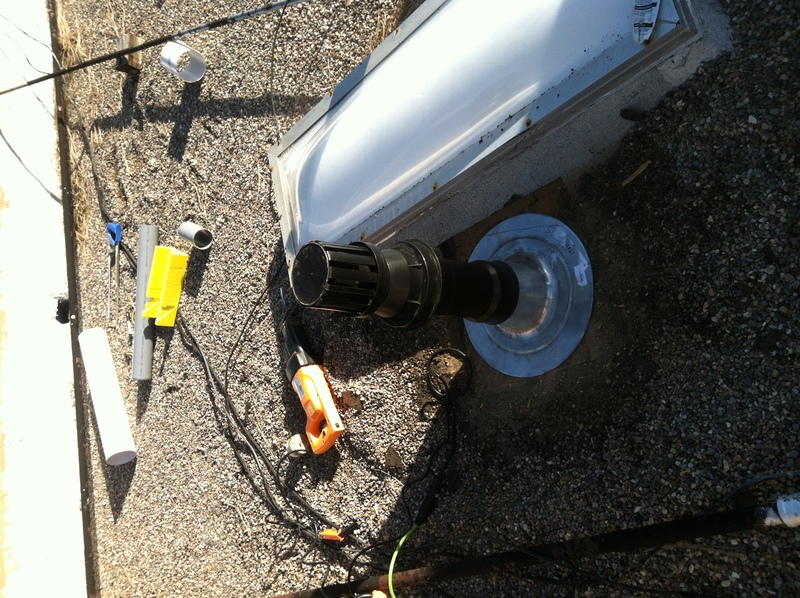 If you need to go through the roof, then you need to purchase the correct vertical vent termination kit for your heater. Do not, under any circumstance think that you can get away with the cheap galvanized or aluminum vent pipe that is readily available at the home improvement warehouses. Some manufacturers state that you can use double wall stainless steel vent pipe but only purchase vent pipe that is recommended by the manufacturer. 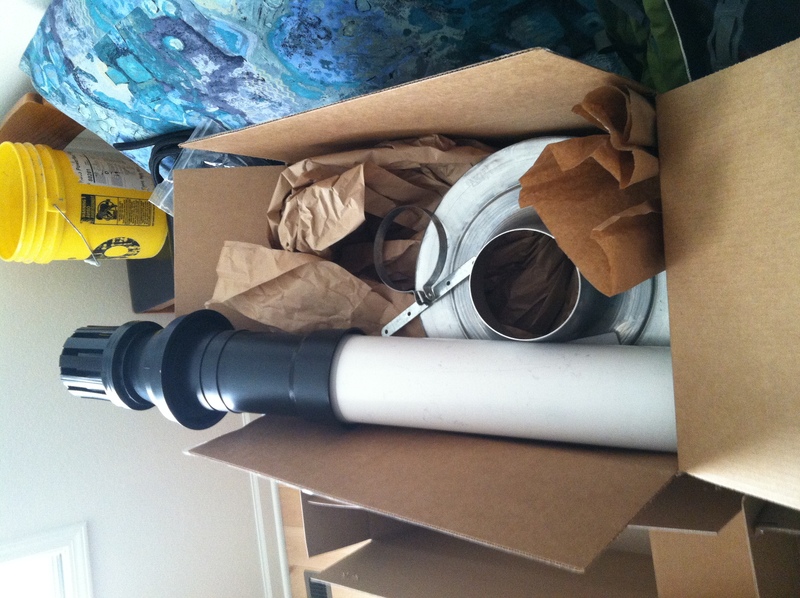 I couldn’t find the necessary vent pipe for my installation anywhere locally so I had to order the vent pipe. The thing to note about the vent pipe is that the heater uses the vent pipe not only for venting the exhaust but also as fresh air intake. 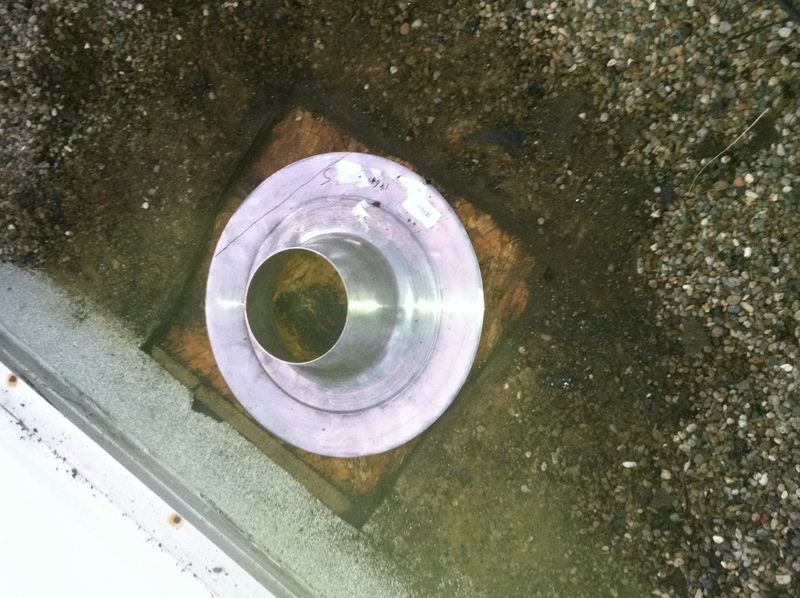 Using the correct vent pipe is critical to the success of your installation. If you use a vent pipe that is not specified by the manufacture of your heater you will likely destroy the heater. There is so much caustic molecules in the exhaust of the heater that the molecules will cause corrosion on vent pipes that are not recommended such as galvanized or aluminum. 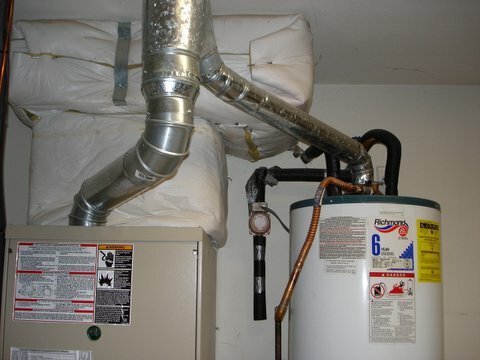 So, spend the money on the correct vent pipe, and get ready for spending most of your installation time on the vent. I was pretty darn nervous that I was going to be cutting holes through my roof and installing the vent pipe. I cut a brand new hole in my roof to support the vent and installed the termination kit for the roof. You have to verify that you leave enough room for clearances between parapets and any other obstructions as specified in the manual of the heater. Incorrect venting could cause the heater to generate a fault and void your warranty. You have to measure twice before cutting any vent pipe and follow the instructions from the vent pipe manufacturer on how to cut the vent pipe. My vent pipe had an interior pipe running through it that needed to be cut longer than the exterior pipe wall. You can see from the picture above that I had to pry the vent pipe using a screw driver. Before you connect two pipe pieces together make sure that you want those pieces connected. It is very difficult to get the pipes removed from one another. I cut off the area that I had to use a screw driver to pry the pipes off. You want the pipes to be absolutely clean of any burrs or defects. If the water heater is condensing, any horizontal vent runs must be angled toward the water heater in order to drain the condensing liquid. Please consult the installation manual for the heater in order to know the minimum angle for the vent. A condensing water heater has two drains on it. The first drain is a pop-off valve in case of a over-pressure situation like a regular tank water heater, and the second drain is for the condensing liquid. My water heater came with a plug installed on the condensing drain. If you forget to remove this plug, or you don’t correctly install a drain to remove the condensing fluids your water heater will rust out. A condensing water heater is truly an amazing feat of engineering. Condensing water heaters have miraculous heat transfer capabilities to remove 98% of the energy in the gas and turn it into hot water. The combustion byproducts of natural gas are water and other petroleum byproducts. The water that is produced from the combustion needs to be drained. Condensing water heaters have miraculous heat transfer capabilities to remove 98% of the energy in the gas and turn it into hot water. The combustion byproducts of natural gas are water and other petroleum byproducts. The water that is produced from the combustion needs to be drained. I chose to drain this condensing liquid to the outdoors in an area that has a lot of vegetation. You should consult your city and or county codes on the proper disposal of the condensing liquid. In my installation, both the condensing liquid and the pop-off valve are drained outdoors through the same pipe. The amount of condensing liquid that is produced from a single shower can easily add up to over 1 cup. You can’t ignore that amount of fluid and you must deal with it. Dealing with this condensing liquid is a small price to pay for the increased efficiency gains of a condensing water heater, and limitless hot water. My existing tank hot water heater had a recirculating pump installed from Taco-Hvac. 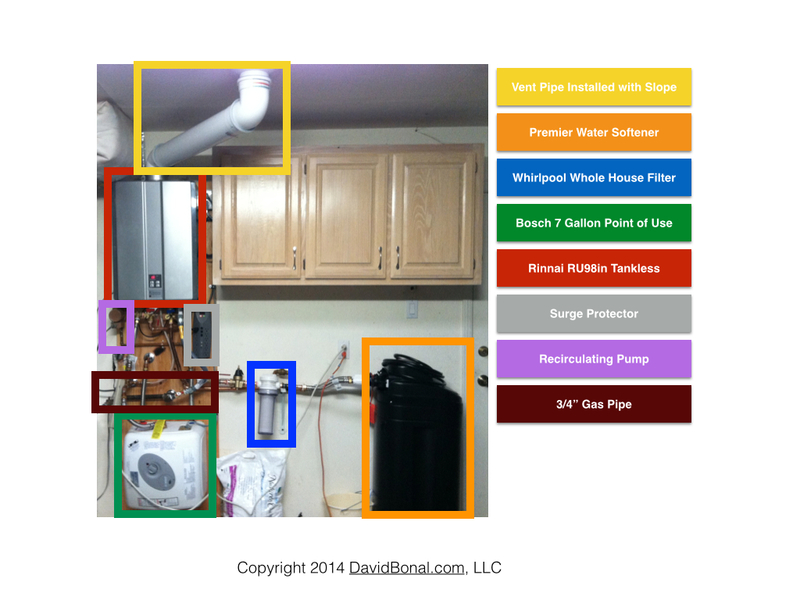 I had this recirculating pump controlled remotely with a SmartHome Insteon Switch . The pump was connected directly to a Smarthome INSTEON Remote Control Outlet . Using the SmartHome switch and outlet provided complete control over when hot water would arrive to the back of the house and prevent the water heater from running more often than what was needed. The challenge with a tankless hot water heater is that they need a flow of water to turn on. I wasn’t too sure that using the recirculating pump would provide enough flow to trigger the burner to ignite. The challenge with a tankless hot water heater is that they need a flow of water to turn on. I spent a lot of time looking at different tankless hot water manufacturers, and I decided that I would go with a Rinnai Condensing Tankless Natural Gas Water Heater . There are a couple of reasons why I made this decision. One was that Costco is selling Rinnai heaters through their installation services and Lowes rebranded Rinnai with Jacuzzi. These are two very reputable companies who are trusting Rinnai. I was also impressed with the quality of the build of the Rinnai heater. The other reason was that I was able to purchase everything from valves, heater, and venting directly from Amazon.com . 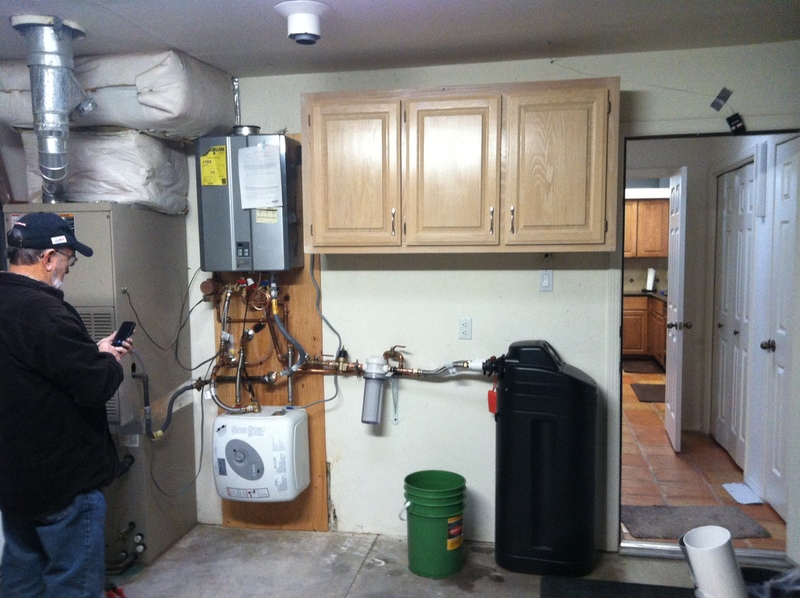 There are two different types of tankless water heaters, condensing and non-condensing. A non-condensing water heater isn’t as efficient at converting the energy in the natural gas to hot water but it is easier to install because you don’t have to worry about the exhaust condensing liquids. A condensing tankless water heater is extremely efficient but it produces a significant amount of condensing liquid. You can expect over 1 cup of condensing liquid to be produced for a shower. You have to drain this liquid from the water heater which increases the difficulty of the installation and the water heater costs are higher. The efficiencies you gain in converting the energy of the natural gas to hot water will pay for the extra costs with a condensing water heater. I have had the system installed for over 9 months, and I couldn’t be happier. We never run out of hot water, and the system has performed flawlessly. There is one catch with the system. If you run the recirculating pump, without drawing any hot water from any of the faucets the hot water coming out of the faucet will be luke warm. This is due to the fact that in my installation I have over 6 gallons of water sitting in copper pipes. As the point of use water heater’s water is drawn into the pipes the cold water that was sitting in the pipes cools the system down. We have learned that if we turn on the recirculating pump and then turn on the shower as an example, the mixing of the water from the tankless water heater and the return water from the recirculating pump will keep the water in the point of use tank hot enough to not notice that there is cold water being drawn from the recirculating loop. The amount of time it takes for the hot water to get to the furthest faucet is less than 20 seconds so running the shower for that amount of time doesn’t consume much water. The last thing to point out which was very scary was that after installing the system, the recirculating pump wasn’t drawing any water to the furthest faucet. I ended up learning that the Taco recirculating pump that I own doesn’t have the ability to self-prime. I had to connect a hose to the recirculating pump after I installed the system and pump water through the recirculating loop in order to remove any air pockets in the recirculating loop. After I primed the system, the recirculating pump and the rest of the system have performed flawlessly and the whole system is completely ‘wife-approved’! I would recommend this install to anybody that has ever wanted unlimited hot water in their house.